Norwegian, the World’s Best Low-Cost Long-Haul Airline and Airline of the Year 2017, operated its first flight from the United States to the “Eternal City” last night. Flights from New York City/Newark launched on November 9 and will be followed by nonstop service from Los Angeles on November 11 and Oakland on February 6, 2018. Norwegian once again carried more than three million passengers in a single month. More than 3.1 million passengers traveled with the company in October, an increase of 14 percent compared to the same month previous year. The strongest growth was on Norwegian’s intercontinental routes, which have increased the number of passengers by 56 percent. Norwegian has been awarded the ‘Best Low Cost Airline – Europe’ distinction for the fifth consecutive year by AirlineRatings.com. Norwegian, which was named Airline of the Year 2017 by the Center for Aviation earlier this month, today launched new routes to the French Caribbean from Providence, Rhode Island and Fort Lauderdale, Florida and increased service on returning routes from New York City and Fort Lauderdale. Norwegian Air Argentina was Wednesday nightgranted concessions to operate 153 routes from Argentina by the Argentine National Civil Aviation Administration (ANAC). These concessions came as a result of the application and consultation of 156 routes. Norwegian (NAS) today reported its third quarter results for 2017. The net result was 1 billion NOK ($125 million), an improvement of 4 percent compared to the same quarter previous year. The load factor increased to 92 percent. The passenger development has been positive in all of Norwegian’s key markets, with a significant growth in the U.S. and Spain. “Plant for the Planet” is the new slogan under which Norwegian has launched a new environmental initiative. 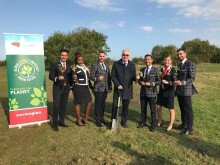 In cooperation with the organization Global Climate Institute Norwegian will plant 7000 trees in the UK and Spain – one for each of the company’s employees. Later this year, Norwegian will plant tens of thousands of trees in other parts of the world. Norwegian was selected by the judging panel at the Centre for Aviation – CAPA for being at the forefront of low-cost long-haul travel, opening nearly 30 intercontinental routes in the past year between Europe, USA and Asia. 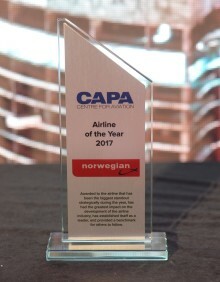 CAPA also recognised Norwegian for its pioneering use of Boeing 737 MAX aircraft on underserved transatlantic routes which is creating demand in new markets. Norwegian and its decade-long corporate social responsibility partner, UNICEF, departed with a Boeing 787-9 aircraft filled with emergency aid for children in need in Yemen this morning. The aircraft used for this mission was delivered to Norwegian just last week and is the airline’s first 787 with a UNICEF livery. The aircraft’ entire cargo belly is filled with emergency aid. Norwegian will this weekend launch its first flights from Denver International Airport and Seattle–Tacoma International Airport to London Gatwick Airport. Flights will launch on September 16 from Denver and from Seattle, Norwegian will operate four weekly flights from September 17. 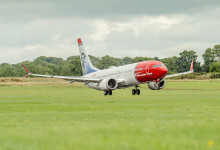 Norwegian today announced its partnership with British low-cost carrier easyJet, allowing passengers to connect a Norwegian long-haul flight with an easyJet short-haul flight in one single booking. Norwegian, the World’s Best Low-Cost Long-Haul Airline for the third consecutive year and Europe’s Best Low-Cost Airline for the fifth consecutive year, last night launched its first flight from Fort Lauderdale-Hollywood International Airport to Barcelona-El Prat Airport. Flights will operate twice weekly on Tuesdays and Sundays, with a Boeing 787 Dreamliner aircraft. Norwegian today launched its double daily service from New York City’s John F. Kennedy International Airport to London's Gatwick Airport. The new morning flight complements the existing late-night flight and will operate daily, besides Wednesdays. 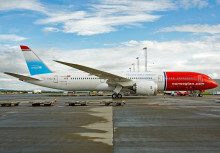 Norwegian marked another milestone in July, as the company carried more than 3.3 million passengers in a single month. The total number of passengers increased by 15 percent compared to the same month previous year. The load factor was 94 percent.